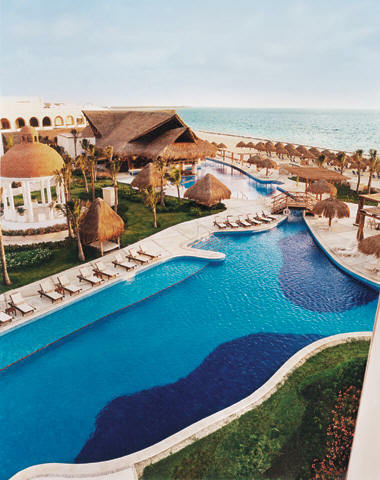 Why book your Excellence Riviera Cancun vacation with Mexico Vacations? If you have a taste for luxury, romance and relaxation, then Excellence Riviera Cancun is where you belong. Situated on a secluded, pure white sand beach on Mexico's Riviera Maya, Excellence Riviera Cancun is only 30 miles from Cancun International Airport, and 1 mile from the picturesque village of Puerto Morelos. Excellence Riviera Cancun is a luxury all inclusive resort and spa in the classic Mediterranean style of stucco, tile and marble. Seekers of romantic seclusion and the excitement of world famous Cancun and the Riviera Maya will find both at the all new Excellence Riviera Cancun. Bordered by sugar-white beaches and the brilliant, crystal clear Caribbean Sea, this tropical oasis truly embraces beauty and splendor - yet is only minutes away from Cancun and the eclectic Playa del Carmen. 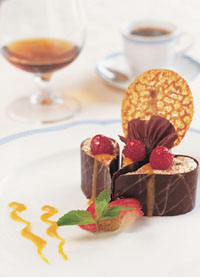 EXCLUSIVE EXCELLENCE CLUB - Representing the ultimate in luxury, privacy, exclusivity and service. All of the Excellence Club suites offer impressive oceanfront views and indoor and outdoor Jacuzzis. At Excellence Riviera Cancun, we surround you with luxury. Whether it’s our suites’ private gardens with the perfect hammocks for siestas, or the private pool access of each of our Junior Swim-up suites, our accommodations are comprehensive and entir ely luxurious. 4-poster King or 2 Double beds, private and furnished patio or balcony, full marble bathrooms, a jetted whirlpool bathtub, separate shower, double vanities, and separate water closet equipped with phoneand sound speaker; bathrobes and slippers, 27” Satellite television, air-conditioning with in-room climate control, CD/DVD player, direct dial telephone, high speed internet data port (additional charge), alarm clock, electronic in-room safe (lap-top size), coffee/tea maker, daily stocked mini bar with beer, juices, soft drinks and water, secret box for room service, adults only (18 and over), handicapped facilities (6 ADA rooms for the physically challenged)440 suites. Represents the ultimate in luxury, privacy, exclusivity and service. 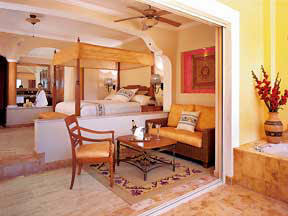 All Excellence suites offer impressive ocean front views, indoor and outdoor Jacuzzis. No matter what your interests, our part of the Caribbean is filled with adventures waiting to happen. Above all, we want you to enjoy as much activity—or as little—as you wish. At Excellence Riviera Cancun resort and spa, you can choose from a mouthwatering array of global dining options. All your meals and snacks are included as a guest at Excellence Riviera Cancun, and reservations are never required at any of our restaurants. If you’d prefer to stay in the luxury of your suite, our convenient room service is available 24 hours a day.